Since 2010, CHOC Children’s has offered the only pediatric program in Orange County for treating vascular anomalies. Our Vascular Anomalies Center comprises a team of specialists who work together to assess and treat all forms of vascular anomalies, no matter how complicated or rare. Our specialists include experts in hematology, otolaryngology (head and neck surgery), plastic surgery, laser surgery, cardiology, wound care, and vascular and interventional radiology. The center is coordinated by a dedicated RN who oversees appointments and follow-up care for every patient. We are committed to not only treating the malformation but always keeping in mind the needs of the whole child—physically and emotionally—both now and in the future. Vascular anomalies can evolve or quickly become worse, leading to bigger problems including vision impairment, infection, bleeding or difficulty breathing (airway obstruction). It’s important to get a prompt, proper diagnosis early on—while the anomaly is still growing—in order to begin effective treatment and prevent other issues. Our team has multiple sources of expertise and uses comprehensive testing to understand every aspect of your child’s anomaly. We use state-of-the-art diagnostics, including 3 Tesla MRI, ultrasound, electrocardiograms (ECG/EKG), echocardiograms, blood tests and genetic testing. As a member of the American Society of Pediatric Hematology/Oncology Special Interest Group for Vascular Anomalies and the International Society for the Study of Vascular Anomalies, we are also part of a network of specialists worldwide who review complex cases together, to ensure that we find the answers your family needs. Medication is an effective treatment for many vascular anomalies. The sooner medication is started, the greater the likelihood that we can prevent the anomaly from growing to a point that requires surgery or more invasive treatment. The most common oral medication is a beta blocker called propranolol, a recent advancement in the treatment of hemangiomas. We also prescribe sirolimus for treatment of lymphatic malformations. We also use a topical beta blocker preparation called timolol. Other medications include corticosteroids and chemotherapy. Some medications may require a hospital stay at first to ensure a child does not experience side effects. Our pediatric surgeons specialize in plastic surgery and head and neck surgery, and perform excision and resection to remove vascular anomalies. Surgery is done at CHOC’s state-of-the-art Tidwell Procedure Center where our ORs are equipped with the latest in technology and safety. 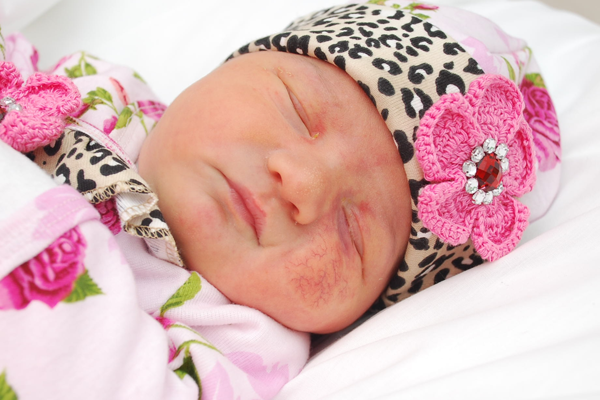 We also offer pediatric anesthesiologists who are trained in using the safest dosages of anesthesia for children. We offer a pulsed dye laser (PDL), a non-invasive treatment for hemangiomas, port-wine stains, bleeding anomalies, and post-surgical scarring anywhere on the body. The laser delivers very quick pulses of energy at a specific wavelength that is absorbed into the skin, destroying the abnormal blood vessels just below the surface. CHOC uses the latest PDL model—the Vbeam Perfecta—because of its level of precision, which is especially important when lasering sensitive areas like near the eye. Patients are sent home the same day and side effects are very minimal, including slight pain or bruising. Most patients require three to five treatments depending on the severity of the anomaly. Learn more about pulsed dye laser therapy at CHOC. Through our partnership with St. Joseph Hospital, we work with vascular and interventional radiologists to treat vascular anomalies using embolization (injection near the anomaly to block blood flow to it) and sclerotherapy (direct injection of a medication that causes clotting of the channels). Some vascular anomalies ulcerate, which means the skin becomes red and swollen, and may produce fluid or bleed, and may lead to infection. We have expert wound care staff who are trained to care for even the most severe ulcerations. Treatment Strategies for Airway Hemangiomas. Geetha Puthenveetil, Jill Stites. Abstract presented at the annual meeting of the American Society of Pediatric Hematology and Oncology in May 2015. Parotid Hemangiomas Require Longer Courses of Treatment with Propranolol. Robin Huffer, Jill Stites, Geetha Puthenveetil. Abstract presented at the annual meeting of the American Society of Pediatric Hematology and Oncology in May 2013. New Approach in Treating Pediatric Hemangiomas. Jill Stites FNP, Geetha Puthenveetil MD, Children’s Hospital of Orange County. Abstract accepted for a poster presentation at the annual meeting of the American Society of Pediatric Hematology/Oncology in April 2010. Durr ML. Huoh KC. Meyer AK. Rosbe KW. Airway Hemangiomas in PHACE Syndrome. Laryngoscope 2012 Oct;122(10):2323-9. Huoh KC. Rosbe KW. Infantile Hemangiomas of the Head and Neck. Pediatric Clinics of North America: Pediatric Otolaryngology. 2013 Aug;60(4):937-49. Dr. Kevin Huoh explains the facts about vascular anomalies and their common treatments. Dr. Dan Jaffurs discusses when a pediatrician should refer a patient to a vascular anomalies specialist. Infantile hemangiomas are benign tumors in children, and most often occur in the head or neck area. Dr. Huoh was inspired to be a doctor after he was treated for a lymphatic malformation as a child. 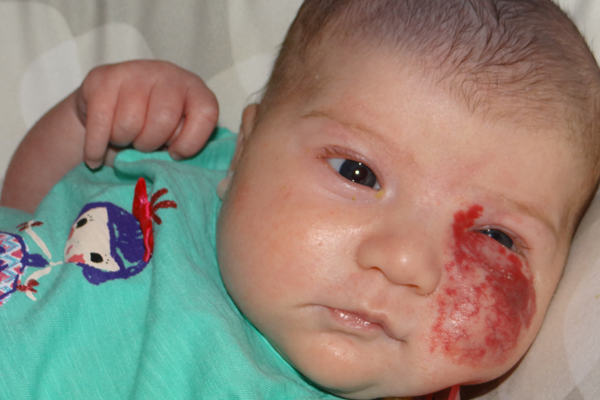 Many babies are born with small blemishes—a little patch of redness here, a birthmark there. These typically aren’t cause for concern, and most go away on their own. But what if they don’t? A new laser treatment at CHOC is helping children like Casey, who was born with an infantile hemangioma that quickly became a problem. A vascular anomaly is a type of growth made up of arteries, veins, capillaries or lymphatic vessels. There are two categories of vascular anomalies: vascular tumors and vascular malformations. Vascular malformations are named according to which type of blood vessel is predominantly affected and may also be known as lymphangioma, arteriovenous malformation and vascular gigantism. Sometimes vascular anomalies are referred to as birthmarks, but many birthmarks do not require medical treatment. How are vascular anomalies treated? Treatment for vascular anomalies depends on the type of anomaly. Medication is most effective for hemangiomas, and some lymphatic malformations. Laser therapy is usually effective for capillary malformations or port-wine stains, which tend to be flat, violet or red patches on the face. Arterial malformations are often treated by embolization. Venous malformations are usually treated by sclerotherapy. Most often, a combination of these various treatments is used for effective management of the lesion. What should I do if my child has a vascular anomaly? If a vascular anomaly is large, growing, bleeding or is affecting body functions like breathing, it should be evaluated by a specialist. Vascular anomalies should also be evaluated by a specialist if they are on the face, near the ear, near the armpit or near the genital/buttocks areas. Talk to your child’s pediatrician about getting a referral to our Vascular Anomalies Center or call us at 714-509-3313 for more information. If your child is experiencing severe breathing problems or the anomaly is infected or bleeding uncontrollably, call 911 or take your child to the nearest emergency department. For more information about the CHOC Children’s Vascular Anomalies Center, please call program coordinator Kim Hai, RN, MPH, at 714-509-3313. Because some vascular anomalies can grow quickly, we can assist with scheduling a timely appointment so that your child can be treated promptly. We also can provide assistance and coordination to families who are traveling from out of the area.